Mr. Charles Thompson began his career at Seneca High School in August 1967 and retired June 1989. During his tenure, Coach Thompson held many titles and feels he did as much or more as an administrator to help and guide the success of the Seneca Bobcats. He began his career in 1967 as a P.E. teacher at Seneca High School and the first ever Jr. High School in 1967-1968. From 1967 through 1972 he coached football (’67-’71), basketball (’67-’72), track (’68-‘69’) and golf (’70-’71). His motto was to never keep records of wins and losses. Developing good students who depended on each other and always gave 100% on and off the field was his focus. 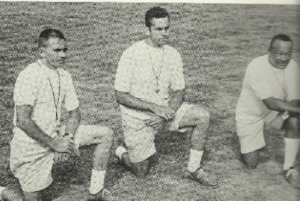 In August 1969 he organized and sponsored the first ever Fellowship of Christian Athletes for Seneca area schools combining Seneca High School and Blue Ridge High School athletes. On February 15, 1972 he was named the principal of Utica Elementary, while continuing to coach basketball. As principal at Utica Elementary, he organized and directed the first ever Special Olympics in Oconee County. This event allowed students from Utica, Oakway, and Keowee Elementary to compete and receive ribbons for several events. He is also credited with developing and implementing the first full time Physical Education class in elementary schools. Mr. Thompson is credited with hiring several current and former teachers and coaches who have all had a significant impact in our Bobcat community. Throughout his career, Mr. Thompson’s focus was positivity, hard work, good behavior, and working as a team. Although he is retired that does not keep him from supporting the Bobcats. He attends almost all football games volunteering to run the Pass Gate. When Football season is over, you will most certainly see him supporting the student athletes at other athletic events.